Nutritionist Chitra spills the secret behind how eating fruits keeps your skin youthful and glowing. Bride of Honor magazine will provide all relevant content to assist brides and grooms in preparation for their wedding day. 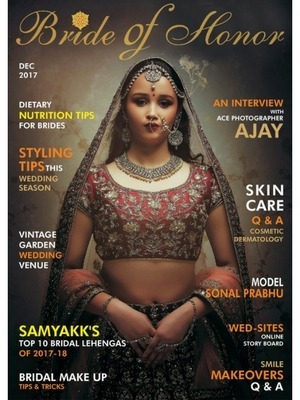 The magazine will feature articles on bridal outfits, skin care tips, interviews with experts from various fields like makeup, nutrition fitness, photography. It will provide varied offers for brides and grooms and styling tips for their shopping. The magazine is an endeavour to provide relevant information about the varied services and products available for the Today’s busy bride and grooms. It is an effort to give information about the importance of personal care and the need to have stress free wedding. Today’s busy Brides and grooms do not take the time off to pamper themselves before the wedding and most of them end up looking tired on their wedding. The magazine gives information and reviews about the various services that are available to make their wedding planning more convenient and stress-free. The online magazine is an effort to ensure all services are available at your fingertips at the click of a button.